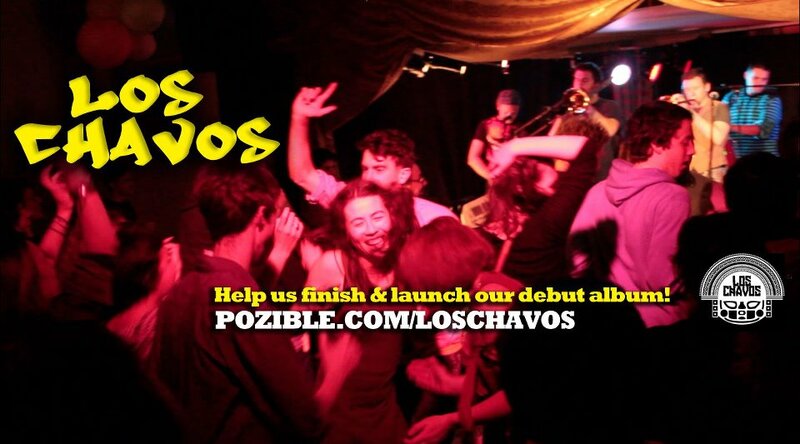 Los Chavos Pozible crowd-sourcing fundraiser (photo taken a little before the interview below was recorded. The tape recorder was a little drunk, so text only). I’m sure there’s a name for the syndrome whereby people who are prone to conducting interviews just cannot stop themselves from whipping out various recording devices at opportune and inopportune moments in order to capture pearls of wisdom from artists and performers. So it was in late August when Los Chavos had just sweated, samba’d, grooved and funked a heaving crowd to a stand-still at the Polish White Eagle Club in Canberra for the Canberra Musicians Club’s regular Friday night gig. At sometime between midnight and 1am, as the band was loading out the side door, I did indeed whip out the trusty Samsung and away we went, starting with some sort of four-way first bump with various band members. Which always works goodly on audio. Speaking of which, thank me now that this written text. We’d all punished the Polish beer a tad by this stage. Bill Quinn: I feel I should know this, but what does ‘Los Chavos’ actually mean? Rafael Florez: Pretty much, “The Guys”. Or “The Dudes”. It’s based on a Mexican TV show called “El Chavo del Ocho”. BQ: So, to translate for an Australian audience, you’re “The Blokes”. RF: The Blokes! With one chick on drums. BQ: Let’s go back a step. Los Chavos: the history. Tell us about that. RF: OK. I’d like to bring Corey in on this one. He’s been with the band since 2006. 2005? Ok.
Corey’s one of the founding members…. Corey Booth: Not quite! Not quite! I joined in 2006. I think Valdis and Andy are the only two founding members left. RF: So we started out playing a few covers of alternative Latin music. Stuff like Los Fabulosos Cadillacs and others. BQ: What was the catalyst? What actually brought the original members together? CB: I think it was Andy (Beimar “Andy” Jauregui) because he sang back in Bolivia and wanted to form a band here. BQ: So when you were looking at an hour set, say tonight at the Canberra Musicians Club, we’ve got two hours at Digress [Restaurant and Lounge], we’ve got 45 minutes or an hour on Stage 88 at Canberra Day: what is it that says, “We’re going to do this cover, this original, the real Latin standard?” What is it? RF: Well, they’re all originals! RF: All, especially tonight. So that’s important to mention. CB: Mostly written by this gentleman right here [points to Simon Millman]. RF: On the album, there’s a bit of a brief to get as many rhythms on there as possible. So what you hear is stuff that’s traditionally played: timba, Cumbia. BQ: So what happens when you’re playing at Digress, and someone comes up and says, ‘Ahhhh, can youse play Guantanamera?’ What do you say? CB: Actually, something like that did happen recently. Someone came up with a request, and we just said, we play originals. Maybe see if you can get the DJ to play it. And they did actually get the DJ to play it. Raf was the DJ! And it was a song we used to play. SM: That’s what you’ve got an iPod for!! CB: I don’t have a problem with people wanting to hear songs that they like. I don’t have a problem with it so long as they don’t have a problem with me saying ‘no’! BQ: It seems to be the world over; doesn’t matter if it’s country and western (‘scuse my French) or Latin, or indie folk, they’re going to ask you for American Pie or something like that. RF: We could play that in Spanish! As a Cumbia song? BQ: So, what’s coming up? RF: So we’ve just finished recording our debut album. It’s taken 16 months recording that. All originals, recorded here locally with a guy called Sam King, a local producer. And we brought it in to the band and everyone liked it. BQ: Right! Merengue. So that’s like a fluffy cake with icing on top? So now we’re trying to raise some funds to master and press the album. We’re going to launch it in an appropriate platform which will showcase what the band does, the roots of the band, and we’re bringing some South American bands in from Sydney (Los Chirimeros, (roots cumbia music) and Melbourne (Inka Marka, Andrean folk). And some locals as well. The album launch is on 2 and 3 November. It’s a weekend festival marking “The Day of the Dead”. So it’s right here [Polish White Eagle Club] on 2 November, and the day after at the ANU Bar. “El Día de los Muertos”. BQ: You’ve mentioned ‘Cumbia’ a few times. What’s its derivation? RF: OK, Cumbia. It’s a traditional rhythm from Colombia, but it has spread out to neighbouring South American countries. Through Mexico, Argentina, Chile. Its roots come from the courtship ritual between the indigenous Indians and escaped slaves, and it’s permeated and mixed with many other types of music. SM: It’s one of those rhythms, like bolero that’s come from Cuba, that’s become a “Latin rhythm” and is played throughout the Spanish-speaking world. BQ: I’m no fan of clichés, but I’m going to go with one now. It sounds like Los Chavos is a bit of a melting pot of music from Latin/Spanish sources. What are they? Jack Palmer: guitar. Australia. Not sure of cultural heritage. BRB. I’m the guest rapper/MC dude. Watup? Colombiano from New Jersey. That’s how we roll. Simon Millman, bass. My family’s from Argentina. Corey Booth, trumpet and backing vocals. Anglo-Celtic, I guess. Rafael Florez. I don’t play anything, I’m the band manager, and my family’s from Colombia.